Lush Face Masks are my absolute favorite to give myself a mini facial with. I think it is awesome that they are so fresh they have to be kept refrigerated - I love natural cosmetics and I feel like these masks are about as natural as you can get. 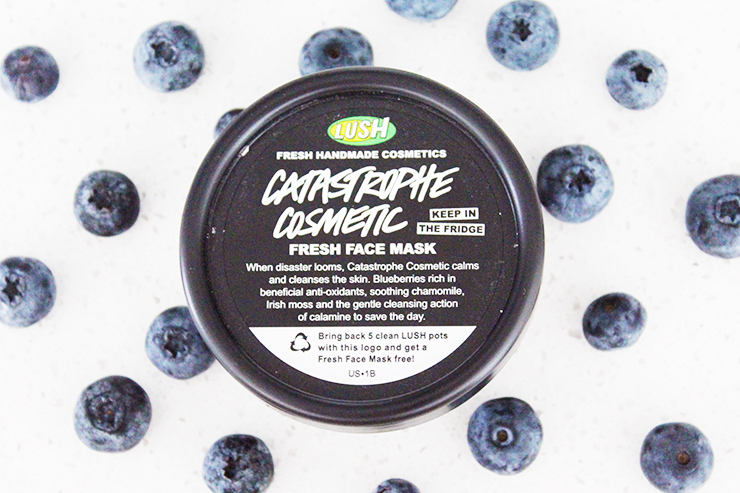 One of my favorite Lush masks is the Catastrophe Cosmetic Fresh Face Mask. This mask deep cleans your skin without irritating it and is safe for even the most sensitive skin; my best friend has rosacea and this is one of her favorite masks to use because it doesn't trigger the rosacea. 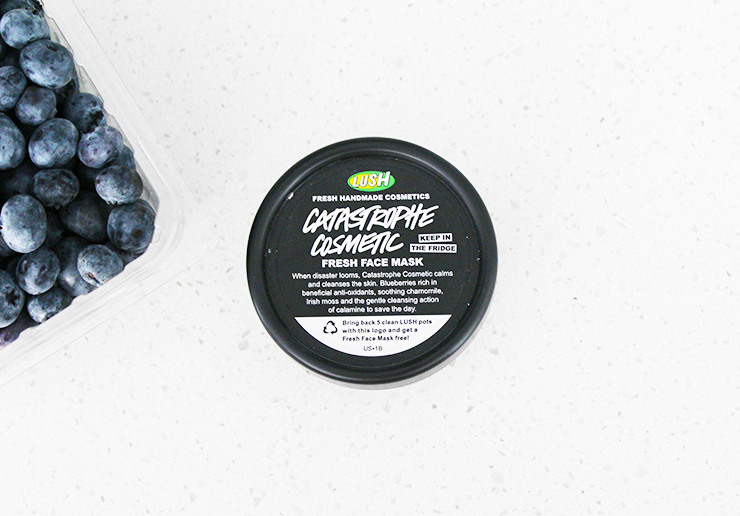 The natural ingredients in this mask include blueberries, calamine powder, almond oil, sweet wild orange oil, and more, all of which work together to both cleanse and nourish your skin. In my opinion after a long day smoothing on a chilled mask feels amazing. To start off take this out of the fridge and apply a thick layer to your clean face. Sit back and relax for ten minutes while the mask works its magic, do not allow it to completely dry on your face. When ten minutes is up wash it off with lukewarm water and marvel at your gorgeous skin; then follow with your usual toner, serum, moisturizer, etc. routine. Everytime I use this my skin is considerably calmer and any blemishes I have are minimized. My skin also feels smooth and looks glowy. I have purchased this mask several times because I love the results and will be doing so again in the future. This mask is great for all skin types, but will be especially helpful for those with sensitive yet acne prone skin because it will treat the acne without irritating your skin, which can be hard to find. It's something I recommend everyone give a try and work it into their regular skin care routine, you will love the results! Have you tried any Lush masks? Which one is your favorite? I have been dying to try a Lush face mask, but just haven't been to the store yet to try them out before I buy one. I have the "Angels on Bare Skin" facial scrub though, and I am in love with it! I rarely use masks and this one sounds like a great one. Thanks for the recommendation!